This statistic shows the total number of households in the Netherlands in 2018, by type. The majority of the households (approximately three million) are composed of single men and women. Roughly 2.3 million households are formed by couples without children, whereas approximately 2.6 million households are multi-person households with one or more children. 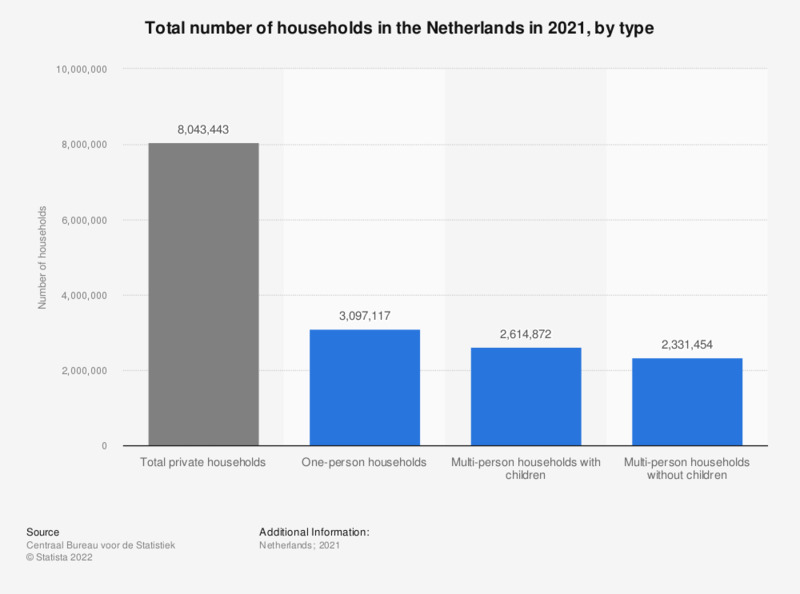 As shown in this statistic, the average household size in the Netherlands decreased between 1950 and today, from approximately four people per household in 1950, to roughly 2.2 people per household today. In the last ten years, the development has been relatively stable though, as this statistic shows. Although the overall decrease is still visible, the development over the last 65 years is particularly striking. With this change in mind, the number of people per household in the Netherlands is only expected to decrease further in the future.